This is a young River that suddenly began flowing at the midpoint of my life. I had been dissatisfied for quite some time by the fact that my invisible spirit alone could create tangible visions of beauty. Why could not I myself be something visibly beautiful and worthy of being looked at? For this purpose I had to make my body beautiful. When at last I came to own such a body, I wanted to display it to everyone, to show it off and to let it move in front of every eye, just like a child with a new toy. My body became for me like a fashionable sports car for its proud owner. In it I drove on many highways to new places. Views I had never seen before opened up for me and enriched my experience. But the body is doomed to decay, just like the complicated motor of a car. I for one do not, will not, accept such a doom. This means that I do not accept the course of Nature. I know I am going against Nature; I know I have forced my body onto the most destructive path of all. Henry Scott-Stokes, The Life and Death of Yukio Mishima. “Muscles, I found, were strength as well as form, and each complex of muscles was subtly responsible for the direction in which its own strength was exerted, much as though they were rays of light given the form of flesh. Nothing could have accorded better with the definition of a work of art that I had long cherished than this concept of form enfolding strength, coupled with the idea that a work should be organic, radiating rays of light in all directions. 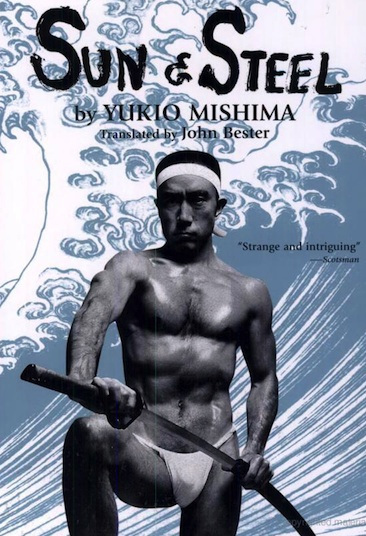 The muscles that I thus created were at one and the same time simple existence and works of art.” Yukio Mishima, Sun and Steel. Self-styling is not always about clothes. I love the way Mishima flaunts his buffness like a fashionable sports car. He devoted himself to body building long before it became a trend. That he did so in a society with little tradition in this arena is all the more remarkable. WOW!He probably wanted to prepare well for his self inflicted death. A Samurai leaves behind a beautiful corpse. That is why Samurai’s used to spend hours pampering themselves before battle. A well groomed head served as the ultimate trophy of battle. Mishima knew that it was pointless to leave behind an old and decaying body. He wanted to be a Samurai, and knew that he must leave behind a body worthy of trophy. Ever since he started bodybuilding he was headed towards his final goal of self destruction.